Keeping healthy horses is expensive. 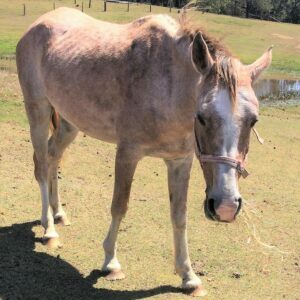 Rescuing and rehabilitating previously neglected horses is even more so. The care costs for a healthy horse in our therapy herd runs at approximately $2,000 per year. In the first year after rescue, we budget on $3,000 per horse to cover extra medical and feed costs. We’ve made the cost of sponsorship $2,400 per year or $200 per month – whichever suits you best. Horses currently in need of sponsors are listed below. Please contact us if you are interested in sponsoring a horse and would prefer to pay monthly, otherwise, you can pay below by credit card or bank deposit. Many thanks for your support.